Schloss Neuschwanstein or the New Swan Stone Castle is the most popular 19-th century castle in Europe. The “castle of the fairy-tale king” was built by King Ludwig II in 1886 in order to withdraw from public life. Opened to the public only seven weeks after his death, this historical shiny palace is visited by 1.4 million people every year. The Romanesque Revival Palace is situated on a hill above the village of Nohenschwangau near Fussen in Bavaria, Germany. The inspiration for its construction came in 1867 when King Ludwig II saw the Wartburg castle near Eisenach and the Chateau de Pierrefonds Palace. Their romantic interpretation of the Middle Ages was enough for him to start an architectural project of building a private refuge in the familiar scenery far from the vast Munich. Furthermore, the music compositions “Tannhauser” and “Lohengrin” of his friend Wagner were a big inspiration to rebuild the enchanting castle. Today the harsh climate has a damaging effect on the facades and the sheer rock walls must be restored. Neuschwanstein is also famous because it appeared in several movies such as the war drama “Great Escape” in 1963, Helmut Kautner’s “Ludwig II” and the musical “Chitty chitty bang bang” in 1968. It is also an inspiration for Disney’s “Sleeping Beauty Castle”. Since 1995 the Castle is on the German list for a future designation as UNESCO World Heritage Site. What's the tour all about? Discover the astounding ancient Castle situated in the hills of the Alps surrounded by the lush and breathtaking scenery. The trip starts from the capital of the Bavaria region, Munich, and proceeds with a 2-hour train or coach ride to the “Cinderella Castle”. The enchanting construction was built by the mad King Ludwig II and looks as perfect as a wonder tale. The white towers of the castle rise magnificently to the heaven. Your guide will also tell you a story about the turbulent times of King Ludwig and his obsession with mythology and music, his true inspiration for building this charming castle. The trip will finish with a ride back to Munich that will offer you a view of the idylic landscapes of the marvelous mountains and valleys. 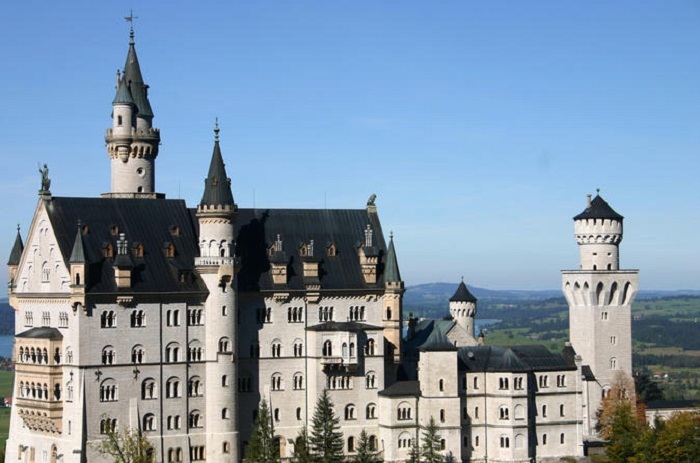 Traveling in a luxury air-conditioned tour-bus you will visit the two dream castles built by King Ludwig II of Bavaria and admire the most impressive achievements of western architecture, Neuschwanstein and LInderhof. Built in Rococo style in the 19th century, the Linderhof Castle is the smallest of three royal castles. Afterwards, you will enjoy shopping in the small municipality of Oberammergau, that is very famous for its painted houses and woodcarvers. In the stunning area in the foothills of the Alps you will notice the magnificent Neuschwenstain castle, the beauty and symbol of the Romanesque style. The interior of the building is a dreamy fairy tale and is inspiration for Disneyland’s Sleeping Beauty Castle. At the end of the trip you will discover the small town of Hohenschwangau where you will have lunch. Admire the beautiful Algau region of Bavaria and see the marvelous town of Hohenschwangau in this full-day trip. Delight in the beauty of the medieval castle and hear the story of the extravagant reign of the controversial King Ludwig II. 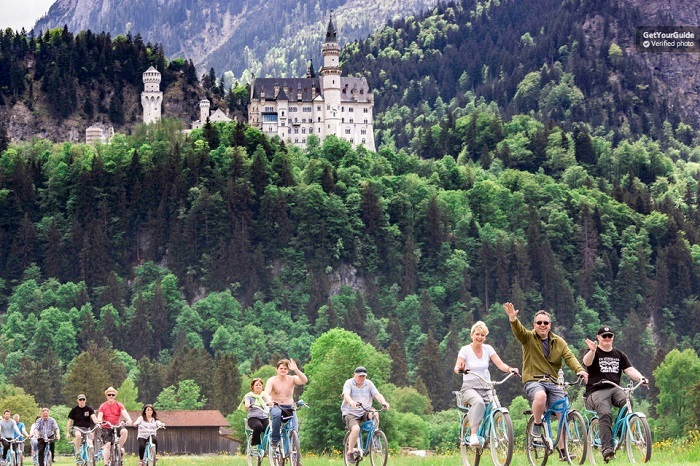 Early in the morning you will take a bike tour around Hohenschwangau and stop at St. Mary’s bridge to enjoy the view of the enticing landscapes of the Bavarian Alps. Once you are there, enjoy a nice swim in a refreshing alpine lake. Inspired by Richard Wagner’s opera “Tannhauser”, he built this medieval spectacle and gave people a chance to find inner piece by living in a fairy tale. Before departure for Munich taste some traditional Bavarian beer and enjoy lunch in a local restaurant in Hohenschwangau. The majestic Bavarian countryside and the amazing setting of Neuschwainstein makes the journey a real fairy tale. 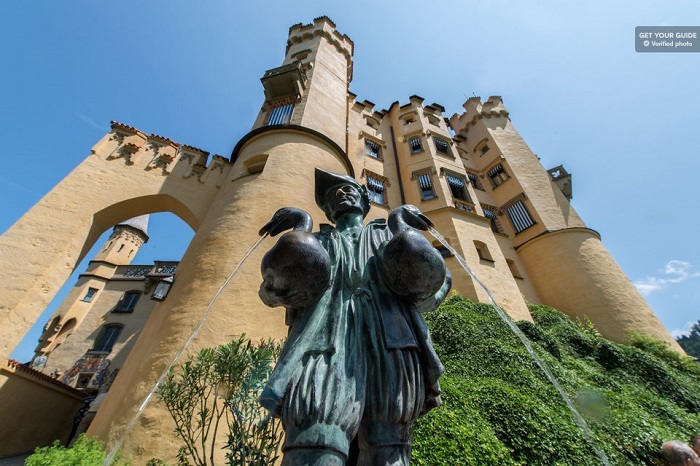 When you arrive you have an exclusive opportunity to see the best of the Cinderella Castle and learn about the controversial life and death of King Ludwig II. Hear more about Richard Wagner’s extraordinary music compositions that were an inspiration for mad King Ludwig II to build this legendary palace. Afterwards, you can climb up to the Marienbrucke and enjoy the perfect views of the neo-romantic masterpiece. You can take a 45 minutes tour inside the castle or you can choose to admire the landscape of the Bavarian Alps. You should take your bathing suit, because if the weather is nice you can enjoy swimming in the crystal-clear water of the Alpine lake. Your guide will also tell you interesting stories about The Swan King, the Hohenschwangau Castle, the Pollat waterfall and Gorge and many more. The tour ends with a ride to Munich in the late afternoon. The tour departs early in the morning from the center of Munich. 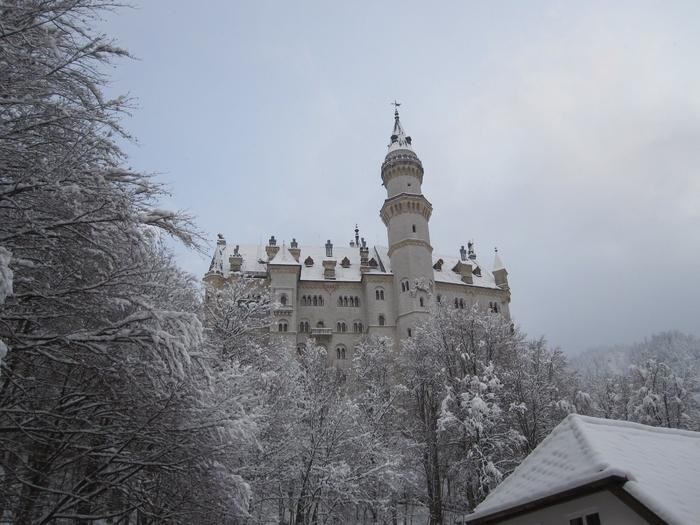 It’s a wonderful winter tour where you will explore the amazing German palaces such as Neuschwanstein, Linderhof Palace, and the small town of Oberammergau. The tickets for the castles will be ordered in advance so you will not have to stand in line. The first stop is Linderhof Palace where you can enjoy the ancient interior before your visit the quaint city of Oberammergau. The city will impress you with unique painted houses, its Woodcarver shops and the delicious food that you can savour in the local restaurants. 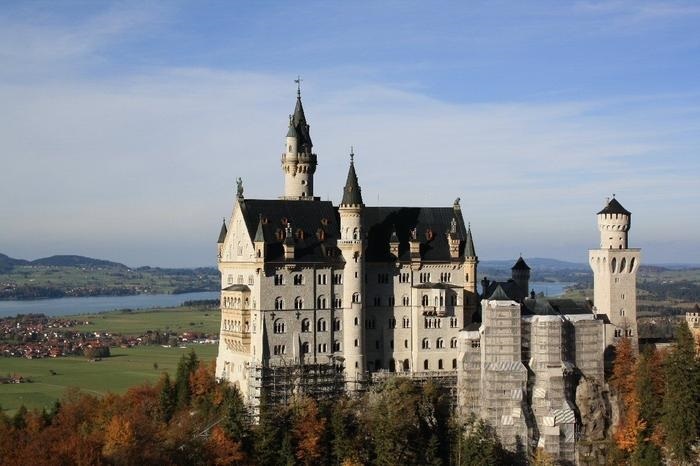 Neuschwanstein Castle is the main attraction of the tour, you will discover the mysterious life and death of the mad King Ludwig II and you will find out if his death was a murder or suicide. You will be enthralled by the Castle’s interior and you will realize why this castle was an inspiration for Disney’s Sleeping Beauty Castle. King Ludwig II named this amazing structure after a character in Richard Wagner’s opera, “Lohengrin”. The meaning of the Neuschwanstein is “New Swan Stone”, which is a character in Wagner’s “Lohengrin”, the Swan Knight. The Castle was built far away from the big Munich because the shy King wanted a private refuge. However, today Neuschwanstein is a place that on some days is visited by up to 6.000 tourists and 1.4 million visitors per year. The harsh climate and cold weather do serious damage to the facades so Neuschwanstein needs constant repairs to be highly preserved. The sheer rock cliffs of the hill must be secured to prevent parts of the structure slipping down the mountain. King Ludwig II was a good friend to Richard Wagner which is the reason why many rooms in the castle were inspired by Wagner’s operas. Even if Wagner never had a chance to visit the palace, the stories depicting penance, love, salvation, and guilt are main themes of the wall paintings in the castle. King Ludwig II of Bavaria had a plan to build the castle in 3 years, but the project took much longer. In the meantime, he had to live in the gateway building and after 12 years, even though the building was still not completed, he finally moved in. He moved into the palace in 1884 but the Square Tower and the Bower were finished almost 24 years later, so the King never had a chance to see the construction finished completely. Seven weeks after his death, the palace was opened to the public as a museum. The design of Disney’s Sleeping Beauty castle was inspired by the Neuschwanstein Castle. This castle is also an inspiration for Cinderella’s castle in the 1950 animated movie and is also part of Disney’s logo before every Disney film. The 1968 musical movie Chitty Chitty Bang Bang shows the Bavarian palace in several scenes. One of the memorable scenes is the evil Baron Bomburst’s Castle, which the family fly over in the car outside the castle. The Neuschwanstein is one of the finalist in the selection of the New Seven Wonders of the World. Since 1995, it is also on the German list as UNESCO World Heritage Site. Even though it is not permitted to take photographs inside the building, the castle is one of the most photographed constructions in the world. Over 1.2 million visitors every year travel to see the enchanting palace and take photos of the fairytale rooms.